Kilimnik eventually became “Manafort’s Manafort” in Kiev, and he continued to lead Manafort’s office there after Yanukovych fled the country for Russia in 2014, according to Ukrainian business records and interviews with several political operatives who have worked in Ukraine’s capital. Kilimnik and Manafort then teamed up to help promote Opposition Bloc, which rose from the ashes of Yanukovych’s regime. The party is funded by oligarchs who previously backed Yanukovych, including at least one who the Ukrainian operatives say is close to both Kilimnik and Manafort. “OVD” stands for Oleg Vladimirovich Deripaska, and “how do we get whole” almost surely references Deripaska’s 2014 lawsuit filed in the Cayman Islands alleging that Manafort and his deputy Rick Gates defrauded him to the tune of $19 million. 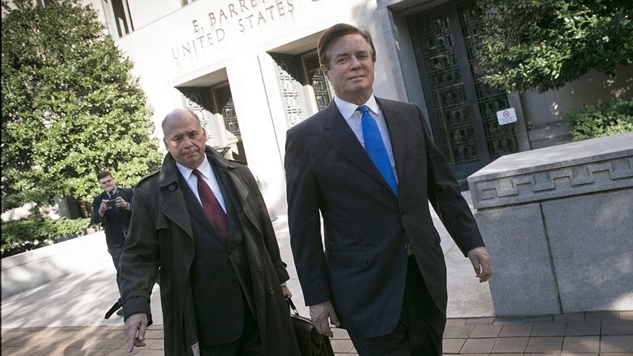 In fact, during a proffer meeting held with the Special Counsel on September 11, 2018, Mr. Manafort explained to the Government attorneys and investigators that he would have given the Ukrainian peace plan more thought, had the issue not been raised during the period he engaged with work related to the presidential campaign. Issues and communications related to Ukrainian political events simply were not at the forefront of Mr. Manafort’s mind during the period at issue and it is not surprising at all that Mr. Manafort was unable to recall specific details prior to having his recollection refreshed. The same is true with regard to the Government’s allegation that Mr. Manafort lied about sharing polling data with Mr. Kilimnik related to the 2016 presidential campaign. Manafort attorneys also accidentally reveal via failed redaction that Mueller says Manafort was in contact with "a third-party asking permission to use Mr. Manafort’s name as an introduction in the event the third-party met the President." Robert Mueller said that Manafort repeatedly lied about his interactions with Kilimnik, and this redacted portion of the filing by Manafort’s lawyers seems to confirm this, but attempts to explain it away by essentially saying “of course the campaign chairman of the GOP presidential candidate couldn’t recall specific details about Ukraine on the spot.” The peace plan referenced is likely the Ukrainian peace plan delivered to Michael Flynn by Michael Cohen that is also being probed by Mueller. While that portion is illuminating, the last sentence is the reason why I am writing this right now. One of the bigger unanswered questions in this whole Russia mess is the operational aspect of it. Paul Manafort and Michael Cohen are walking paper trails, and it’s easy to see how the Kremlin merged on to the highway of standard corruption in American politics in order to influence men who exist solely to peddle influence. What we don’t know, and I suspect that it is because the news around Michael Flynn has been largely silent while he cooperates with the government, is how these constant connections between the Trump camp and Kremlin cutouts led to any tangible events. Here, Manafort’s lawyers may have flat-out told us about one. [The IRA] ad a strategic goal to sow discord in the U.S. political system, including the 2016 U.S. presidential election. Defendants posted derogatory information about a number of candidates, and by early to mid-2016, Defendants’ operations included supporting the presidential campaign of then-candidate Donald J. Trump (“Trump Campaign”) and disparaging Hillary Clinton. Defendants made various expenditures to carry out those activities, including buying political advertisements on social media in the names of U.S. persons and entities. Defendants also staged political rallies inside the United States, and while posing as U.S. grassroots entities and U.S. persons, and without revealing their Russian identities and ORGANIZATION affiliation, solicited and compensated real U.S. persons to promote or disparage candidates. Some Defendants, posing as U.S. persons and without revealing their Russian association, communicated with unwitting individuals associated with the Trump Campaign and with other political activists to seek to coordinate political activities. The same is true with regard to the Government’s allegation that Mr. Manafort lied about sharing polling data with Mr. Kilimnik related to the 2016 presidential campaign. Robert Mueller already knew about this. This line is Manafort’s lawyers attempting to explain the lies Mueller says he caught their client in. This isn’t a screw-up in the sense that Manafort’s attorneys hurt their legal case by exposing this to the world, but in that it sure doesn’t help the public perception of their client. Every day, what is possible in this case seems to expand, and today, we got confirmation from Paul Manafort’s lawyers that Donald Trump’s campaign chairman shared campaign polling data with a man who literally came up through Russian military intelligence. The next question is: why?